Besides having an avid interest in poetry, especially Haiku and Senryu, Joseph J. Truncale has been involved in the martial arts for more than sixty years. He first took up wrestling and boxing in 1956. He joined the U.S. Navy in 1959. In 1961, he began training in Judo and Karate while stationed in Japan aboard the USS Oklahoma City, a guided missile cruiser. He continued his training in Judo and Karate while in the Navy until his honorable discharge in November of 1963. Always seeking more martial arts knowledge, he joined a Shotokan Karate club under Mr. Sugiyama, Sensei, (Japan Karate Association) who was also the Chief Instructor for the Japan Karate Association Shotokan Karate in the Midwest at that time. In 1965, he joined the Glenview, Ill Police Department, and studied Judo at the Glenview Judo club at that time. He also continued his Shotokan Karate training under Mr. Copland, Sensei, who was also a student of Mr. Sugiyama. When Mr. Copland moved from the area, Mr. Truncale continued his training with Mr. Loren Rogers, Sensei, who was also a student of Mr. Sugiyama. At that time, Mr. Truncale also attended numerous police arrest and control classes, becoming a certified instructor in many police tactics systems. He has been involved in the martial arts for more than 60 years, studying many combat and weapons systems under numerous excellent police and martial arts instructors. He has earned Black Belts in Jujitsu (Kudan), Karate (Rokudan), Judo (Godan), and Kobudo (Sandan). Even though Mr. Truncale was inducted into the United States Martial Arts Association Hall of Fame as a Master in 2002, he still considers himself merely a lifetime student of the martial arts. After many years of Tai Chi training with Laurie Manning, the Ching Ying Tai Chi Kung Fu Association awarded him his official teaching certificate in Tai Chi. He is also proficient in the use of the Martial Art wooden and metal rings, which are part of many Kung Fu systems like Wing Chun, Praying Mantis and some Tai Chi systems. In 1973, Mr. Truncale founded the first Karate club in Glenview, and was one of the first karate clubs on the entire north shore of Chicago at the time. Though Mr. Truncale has worked in all areas of law enforcement, his special expertise is in the police defensive tactics and police weapon fields. He has designed numerous police survival courses and taught police and security officers from all over the world at international seminars. He is a certified International Instructor in the PR-24 Police Baton, the Straight (Expandable) Baton, the Monadnock Defensive Tactics System, (MDTS) and the Persuader Baton (Short stick). He is also a Master Instructor in the CLAMP, GRASP, and in OC Spray. He has had the honor to have trained under some of the most talented martial art and police instructors in the world. He is the founder (Soke) of Bushi Satori Ryu, a Jujitsu/Karate style that blends the traditional Samurai arts with modern combat methods. Sixteen martial art weapons and twelve police weapons are part of the Bushi Satori Ryu System. 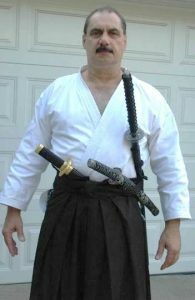 He has created Samurai Aerobics, the Pro-Systems Short Stick Course, Police Weapon Retention System, and the Knife Handling and Knife Defense System for police and security officers. He has more than 3000 papers (articles, essays, reviews, poems) and more than 70 books/manuals published. He also has written several columns and has had his own newsletter (The Samurai Heart Newsletter) for many years. He was one of the founding directors of ASLET. He was on the advisory board of the International Law Enforcement Educators and Trainers (ILEETA) Association and the Illinois Police Instructor Trainer Association until he retired from full time teaching. He has been a member of many professional associations and has taught numerous police and citizen self-defense courses. He is now retired but still teaches seniors Tai Chi and the use of the Martial Arts Ring for fitness. He also teaches some semi-private lessons and is available on a limited basis for seminars and private lessons. He also writes regular reviews of books, weapons and other products on Amazon. The Shotokan Karate Self-Defense Manual: Practical Combat Karate. Walking With Warriors: The Best of the Street Warrior. Karate Combatives: Reality-Based Karate for the Street (Vol. 1). Weapons of Karate Combatives: Karate Combatives (Vol. 2). Seated Zen Karate for seniors and the physically challenged. Zen Poetry Moments: Haiku and Senryu for special occasions. Chair/Seated Tai Chi/Qigong/yoga for seniors and the physically challenged. The Samurai Seated Workout Program. Martial Arts and Warrior Haiku and Senryu. Chair/Seated exercises using the exercise ring for seniors and the physically challenged. Chair/Seated Martial Art Ring (Bamboo and iron) exercises for seniors and the physically challenged. Advanced PR-24 Police Baton Techniques.